Premium Walnut Solid Wood Desktop. Click here to select the desktop above. What is the difference between the 1.5" thick Solid Wood Bamboo and your other 1" thick bamboo? Besides just giving you an extra 0.5" of thickness, the standard bamboo top is a UV-cured bamboo that we stock in our warehouse. It comes with or without a center cut-out and will ship out in 1-2 business days. The Premium Bamboo is made from fully matured Moso bamboo. This denser bamboo features a beautiful vertical grain. Each desktop is custom-made when you order and will ship out in 12-14 weeks. Absolutely! Each UPLIFT Desk Solid Wood Desktop is handmade, which means it can be made to your exact liking! Changing the sizes won't increase the lead time, either. Contact our customer service team for a quote. An ergo edge is unavailable with the solid wood desktops. At 1.75" thick, these desktops are beasts. Solid wood is a very durable surface and will harden with time. However, the surface may scratch or get dull if you don't maintain it. If you live in a very dry climate, you will need to keep your desk hydrated with lemon oil. Otherwise the wood may dry out and crack. We have combined all of the care items needed to maintain your solid wood desktop in one easy kit. You will want to clean the surface of your desktop with lemon oil. The oil also helps keep the wood properly hydrated. Use the oil with furniture cloths to help polish the surface. If scratches do occur, you can gently buff them out with the steel wool pad. I just received my desk and the color of the wood looks a little off, are you sure it is the wood that I ordered? Although we are not immune to errors, your freshly harvested desktop may look a little different than a mature desktop. Different species will be either a little lighter or darker than their aged counterparts. Over time the color will eventually even out. How can I feel good about chopping down an innocent tree for my custom desktop? We have partnered with the National Forest Foundation to plant five trees in U.S. National Forests when you buy a solid wood desktop. You can rest a little easier at night knowing that the new trees will help beautify our national parks. Will the surface be smooth? Natural wood is, well, natural and may contain some bug holes, knots, and imperfections. Our woodworker smooths these out by adding either black or clear filler to smooth out the surface of the desk. We're proud to offer more than a dozen species of solid wood, along with multiple wood stain and barkline options so that you can create the desk that you want. Our woodworkers boast years of experience with these native Texas woods, and have been hired by us specifically for their speediness and attention to detail. Each desktop is custom-made and one-of-a-kind, so your finish may vary slightly from our photos. The UPLIFT Rectangular Solid Wood Desktop is available in several standard sizes. Choose a depth of 24'' or 30'' and a width of 42'', 48'', 60'', 72'', or 80''. If you want a custom size wood desktop up to 96'' wide, give us a call for a quick quote. Your UPLIFT Solid Wood Desktop can be ordered with square edges on all four sides, a natural barkline on just the front edge, or a natural barkline on the front and back edges of your desk. We give you the option to add wire or power grommets to your desktop. Wire Grommets let you route your cords and cables through a swiveling slot that opens and closes on your desk. 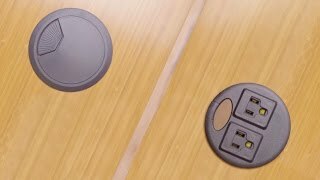 Or upgrade to a Power Grommet, which adds a duo of power outlets to each grommet hole, giving you freedom to power and charge devices straight from your desktop.